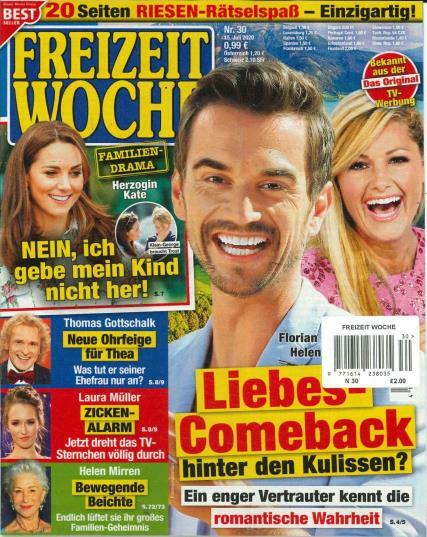 Freizeit Woche is a German language current news report and interview magazine. Buy a single copy or subscription to Freizeit Woche magazine. There are fifty one issues per subscription which classifies Freizeit Woche as a weekly magazine. There are reports and interviews from national and international celebrities from the music, film, television and show venues. This is the highlight of the magazine. In addition, there are articles on sub-health, travel and information regarding financial and legal affairs. Freizeitwoche publishes a section on daily life guidance for German and international readers. This German magazine gives advice and highlights cosmetics and hairstyles as well as food and healthy living topics. There is a wonderful food section that provides a listing of wonderful recipes with pictures and recipes. Read about the latest appliances and tools used in the kitchen. Find out where you can purchase all the fashions, decorating accessories and appliances by reading the listing at the back of the magazine. Purchased for my mother - it makes her week.